The NBA Finals have officially reach bat-poop crazy status. The Cleveland Cavaliers have erased a 3-1 deficit in the series and forced a Game 7 back in the Oakland. But before the clock hit triple-zero, Stephen Curry fouled out and then was ejected when he threw his mouthpiece and hit a fan. Curry apologised to the fan before he left the court and after the game, head coach Steve Kerr ripped the officiating for calling “ticky-tack” fouls on Curry and creating a situation where he lost his cool. 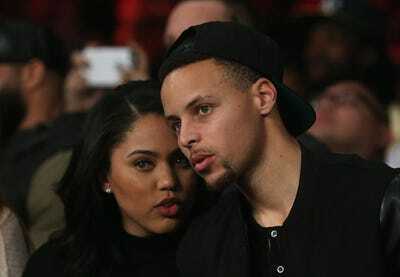 But the strongest comments may have come from Curry’s wife, Ayesha. 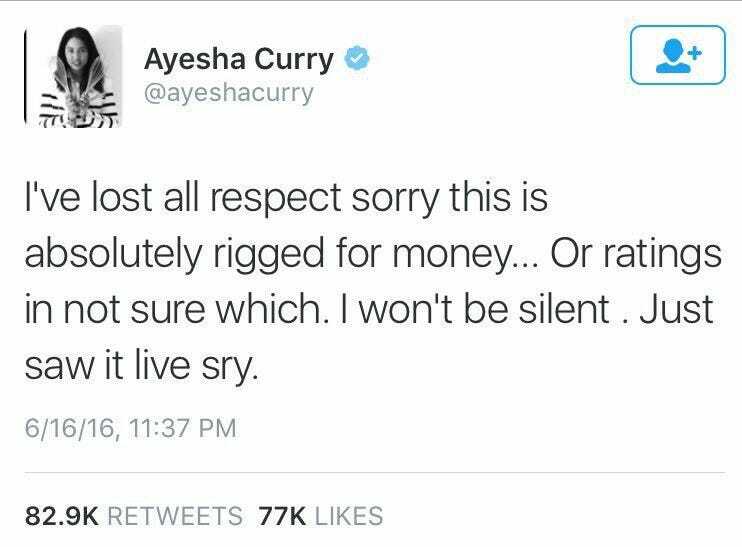 Almost immediately after Stephen was ejected, Ayesha tweeted her disgust with the situation, accusing the NBA of being rigged. The tweet was quickly deleted. Here is a screencap via The Big Lead. No rational person is going to accuse the NBA of rigging this game just to force a Game 7. And it is hard to expect the wife of a player to speak rationally after a tough loss like this one. 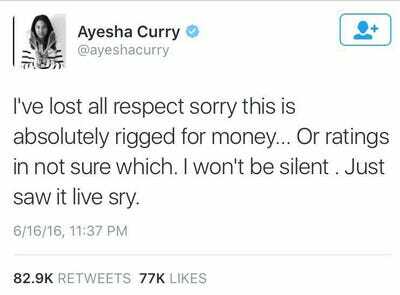 That being said, the NBA, of all leagues, is sensitive to any talk about being rigged. Stephen is already in danger of being suspended for Game 7 and now it seems like he is probably going to get a lecture on what his family members are tweeting during the most-watched games of the year.